Dominica is serviced by two airports: Douglas-Charles (DOM), (formerly known as Melville Hall,) and Canefield (DCF) Airports. 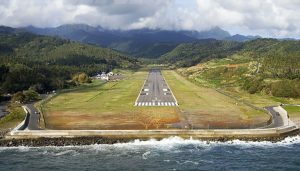 Most visitors to Dominica will arrive through Douglas-Charles, the larger of the two airports located in the north-eastern side of the island. It is located approximately one hour from the capital city of Roseau. Canefield Airport, a smaller airport with a smaller runway, is 15 minutes from Roseau. International flights from US and Europe generally connect to the island via hubs in Antigua (ANU), Barbados (BGI), St. Maarten (SXM), Puerto Rico (SJU), and Guadeloupe (PTP.) Leeward Island Air Transport (LIAT) offers direct connections from ANU, BGI, and PTP into Douglas-Charles Airport and into Canefield Airport from Antigua (ANU). Windward Islands Airways (WINAIR) has scheduled service between Guadeloupe (PTP) and Douglas-Charles Airport and onwards to St. Maarten (SXM) several days each week. Seaborne Airlines provides daily service into Douglas-Charles Airport from Puerto Rico. The airline has a code share agreement with American Airlines allowing travelers to book their flights to Dominica directly through American Airlines. Most airlines with scheduled service to Dominica can book online or through a travel agent. Click here to determine the best way to get to Dominica from wherever you are.